Item Lore: A stone that glows with an beautiful inner light. 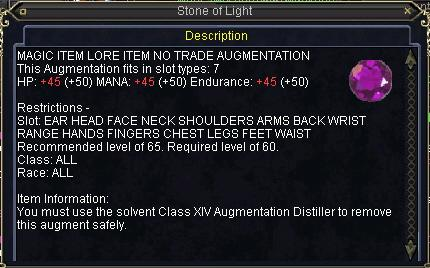 I had this item (Stone of Light) drop for me in Yxtta today, off "an unmasked changeling". I was fighting "a ra`tuk destroyer" in the temple east of Jerimo Jiao, when it turned into "an unmasked changeling" (like those which randomly spawn in Infected Paw, added when Infected Paw was a hotzone) with the same graphic as my character. Note that the mob cast the spell "Phantasmal Shift" just before it turned into the "an unmasked changeling". [Thu Jan 29 03:20:59 2009] A ra`tuk destroyer tries to hit YOU, but YOU dodge! [Thu Jan 29 03:20:59 2009] an unmasked changeling shrieks in terror at being discovered! [Thu Jan 29 03:21:07 2009] Your faction standing with Hexxt got worse. [Thu Jan 29 03:21:07 2009] Your faction standing with Nihil got better. [Thu Jan 29 03:21:07 2009] You gain group leadership experience! [Thu Jan 29 03:21:08 2009] You gain party experience!! [Thu Jan 29 03:21:08 2009] an unmasked changeling's corpse shakes the earth as it crashes to the ground. [Thu Jan 29 03:21:08 2009] You have slain an unmasked changeling! So it's a bit fishy to see the unmasked changeling mechanism show up in Yxtta now, and to have it drop this item. Recent posters suggest it may be dropping in other GoD zones too. Had one of the ra'tuk in Ferubi turn into an unmasked changeling, and it dropped this. Wondering if this is "working as intended?" Dropped for me twice today in West Freeport. Both from 'an unmasked changeling' that spawned from 'a deathfist pawn' and 'Deathfist Pawn'. Had one drop today from an Elemental Breeze Lord that morph'ed into an unmasked changeling. A nice fight.